We have featured a number of miniature phalaenopsis species and this is one of the most dramatic. This miniature Phalaenopsis species is native to the Philippines and Southern Taiwan where it is reported growing as an epiphyte in lowland forest near streams. The small flowers are produced on arching spikes that continue to grow for several months with successive flowers each lasting about a month. It’s habitat suggests a need for constant warm temperatures and so we find the greenhouse a little cool in winter but a centrally heated house perfect. I love this little orchid. It looks so cute in the coffee cup. I remember there was one in a gold coffee cup, last year, that looked fantastic too. 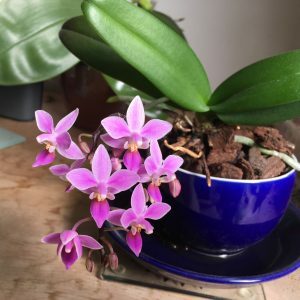 It sounds a “good value orchid” if it flowers for several months. Do you have any of these for sale? Yes we have moved it into a larger cup. We are hoping to produce a viable pod this year and so seedlings in about 2-3 years – worth waiting for.